Searching for an exceptional campsite in Devon? Why not pitch up at our multi-award winning holiday park, offering pitches set in the breath-taking Devon countryside. Find out why we’re rated #1 on Trip Advisor for Dawlish campsites! Our grass, hard standing, and fully serviced pitches are perfect for your tent, caravan or motorhome. 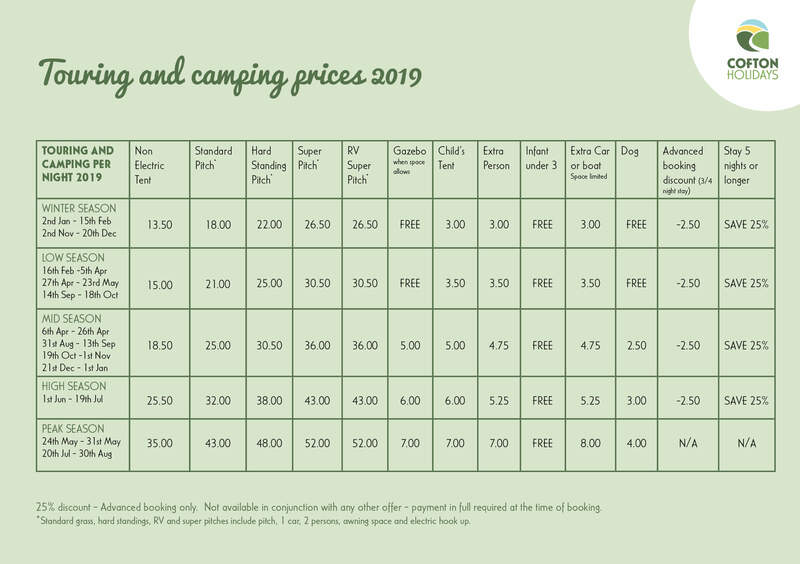 We have pitches available all year round so you can enjoy camping breaks outside of our busy peak times. Why do tourers and campers love staying in our campsite in Devon? It might be our spotless shower and toilet blocks, heated in the winter months to keep those tootsies warm! It could be our location that makes us the preferred Dawlish campsite, we’re just minutes from the M5 motorway at Exeter making us perfectly placed for you to access the awesome attractions South Devon and beyond has to offer. Love the feeling of sand between your toes? The Blue Flag beach at Dawlish Warren is right around the corner! Thanks to our fabulous facilities we’re open all year round, so find out more about our swimming pool, fishing lakes, and indoor play areas. Our entertainment runs daily from April through to October, and we host a number of family activities during school holidays! Do you require basic grass, hardstanding, RV, accessible or fully-serviced pitch? Our tent and caravan pitches are scattered throughout our beautiful site, they are all within walking distance of the amenities and the facilities. You may catch the scent of a warm croissant wafting across your pitch in the morning. That’ll be coming from our onsite shop, stocking everything from locally sourced bacon and sausages to all the camping essentials such as tent pegs and gas. We love meeting all of your four-legged companions! So we’ve made it even easier for them to enjoy the camping holiday too! We have our very own traditional country pub, The Swan Inn, with a jar of doggy treats and blankets awaiting your visit! You can stretch your legs on our dog exercise field, or take a seaside stroll with the help of our dog friendly beaches guide! In addition to our touring and camping pitches we have a great range seasonal caravan pitches for those that never want to go home, we also have caravan storage and we can tow your caravan out so its ready for your arrival. Caravan rallies are welcome outside of the Peak Season and subject to availability. Our grass pitches are suitable for tents, touring caravans and motor-homes, they all come with electric hook-up, are level or terraced and individually marked out. For tents, we have a range of grass camping pitches, in various locations across the park. The Orchard is reserved especially for tents – pitch up between the apple trees, especially nice in the spring when they are in blossom. The orchard is a stone’s throw from the main park facilities including the indoor pool and fish & chip take-away, and is a short walk from the fishing lakes. Thats not to say you may choose to pitch in one of our other locations. Motor-homes and Touring Caravans can use the most of the touring park and the pitches a slightly off level and its always easy to level up. In Mid, High and Peak season we open the Barnfield– at the top of the park which hosts great views across typical Devon countryside with large generous sized pitches and plenty of space for the children to run around. Our Ten Acre field is next to the woodland adventure area and swimming pools as well as the sports wall and children's play area. The Twelve Acre is again open during peak season is a lovely quiet location next to the walking trail to Dawlish Warren. Any pitch may be booked without electric hook up and/or without water or drainage upon request. The hard standing pitches are located mostly in the Oakfield with some also available in the Ten Acre. In the Oakfield you can park your touring caravan or motorhome right next to the fishing lakes and have electric hook-up with plenty of space for your awning and car. These pitches are suitable for motorhomes and caravans only, you can pre-book particular pitches upon request and some have TV aerial and WiFi access points (WiFi charged separately). WiFi access point (WiFi charged separately). Suitable for motorhomes and caravans only, these pitches are pre-bookable. The RV pitches are pre-bookable Super Pitches with waste and water points and electric hook-ups. They are 10m wide and large enough to take long vehicles. Located in a spacious area with a private feel yet a short walk from the main park facilities, these pitches are designed especially for RVs. Accessible camping is pre-bookable and provides a short, level walk to the toilets and shower facilities. There are also dedicated disabled camping pitches in the Camping Orchard. Pre-booking is recommended for these pitches. We have two rally fields we can set-aside for rallies and we welcome rallies of all sizes. We accept rallies at all year round except during our peak six weeks at the end of July and during August. During quieter periods we are able to offer you use of our family lounge bar for private functions. Our discounted rally rate is available to groups of 20 or more units with a minimum stay of two nights. This includes caravan (tent or motorhome), awning, electric and up to five people. For rallies between 20 and 29 units we allow one pitch free for the rally steward and for rallies of 30 or more units we allow two pitches for rally stewards. Prices include unit (caravan, motorhome or tent), electricity, awning and up to 5 people and VAT. During the winter and other periods where the weather can be inclement, we will only be able to offer Hardstanding pitches (subject to availability).